Under picture perfect racing conditions at Sonoma, California, the IZOD IndyCar Series held the qualifying session for the 2010 Grand Prix of Sonoma. 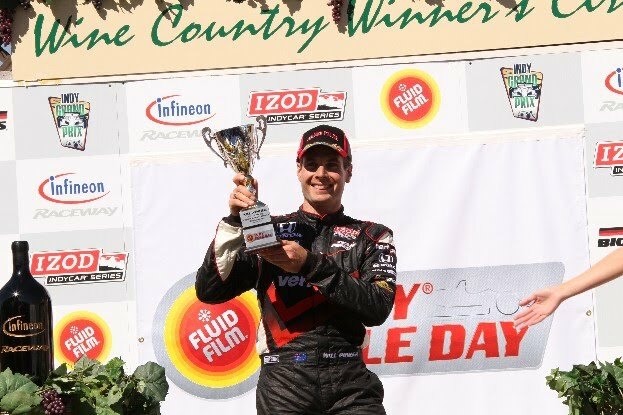 Acclaimed as the 2010 IZOD IndyCar Road Racing Champion, Will Power in the #12 Penske Racing wanted to cap the year by winning the final road course race for this season. As always, a host of open wheel drivers will be mounting a definite battle to assure the Infineon Raceway win will elude Will Power for at least another year. As cars took to the track, Helio Castroneves and Will Power for Team Penske topped the divided round 1 time trials. Having been bettered by the Target/Chip Ganassi Racing duo of Dario Franchitti and Scott Dixon through both practice sessions, Penske Racing reloaded for qualifying preparing to launch one of their bullets for the team's 11th pole of the 2010 IZOD IndyCar Series season. Leapfrogging into the Firestone Fast Six match, the contenders for the Grand Prix of Sonoma pole were the trio of Penske Racing cars piloted by Castroneves, Power and Ryan Briscoe as well as the Target/Chip Ganassi Racing bunch of Dario Franchitti and Scott Dixon. Completing the grouping was last week's surprise front-runner (well, maybe not entirely a surprise) #77 of Alex Tagliani entered by the FAZZT Race Team. Once the 10-minute timed session began, Will Power laid stake to the pole position with a 1 minute, 16.7998 second time on his first flying lap. One minute later, Helio Castroneves unleashed an drastically improved pole time of 1 minute, 16.5652 seconds which remained unbeatened until the final moment of the Firestone Fast Six round of qualifying. Team Penske's Will Power sailed his #12 car past the #3 belonging to his corporate affliate Castroneves. Using a 1 minute, 16.5282 second lap time arounf the 2.33 mile of Infineon Raceway, Power scored his 8th pole of the year. Setting an IRL/IZOD IndyCar record for most poles in the season, Will Power will be partnered with teammate Castroneves on the Grand Prix of Sonoma's front row. "I wasn't sure I was going to pull it off in the second round of qualifying. I was two-tenths off from the Fast Six. I knew it was going to be very close for pole here. I'm really stoked to get the Verizon team a record eight poles this season." Will Power said on the post-race interview while Helio Castroneves positively reflected on the all-Penske Racing front row. In third, last year's Infineon race pole winner Dario Franchitti will have a slightly uphill fight to repeat ahis 2009 race victory. Confidently, Franchitti uttered "We're definitely going to try to get (Will) tomorrow." Rounding out the top 5 was a magnificant effort from the FAZZT Race Team with Alex Tagliani behind the wheel and the Edmonton race winner Scott Dixon driving the second Target car. 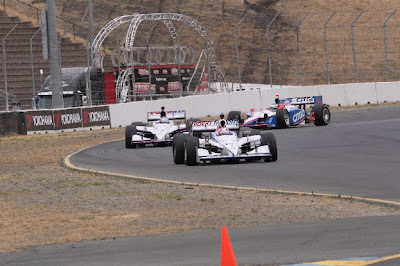 Other notable qualifying runs in the final road course time trial of the 2010 IZOD IndyCar Series included the effort from rookies Simona de Silvestro and Bertrand Baguette. Holding the lead in the rookie points for this IZOD IndyCar season, de Silvestro's qualifying has noticeably improved with an 11th place starting spot after qualifying at Sonoma. As for Baguette (obtaining his familar #34 through a Conquest Racing number swap which sees Dracone taking the #36), he should be praised for his late runs this season considering the fact he wasn't even added to the IZOD IndyCar tour until the 3rd race at Barber Motorsport Park.